If you are reading this, then you have likely already made the decision to join an elite group of non-destructive testing professionals around the world that are responsible for the safety of our growing infrastructure. From buildings and bridges to airplanes and even spacecraft, non-destructive testing professionals are responsible for ensuring the integrity of many of the things people use every day. So, if you’re interested in a lucrative and fulfilling career that spans a variety of industries, you’ve found the right post. STS NDT offers classroom training that will fulfill all of the required formal training to get your career started in NDT. The training you will receive at STS NDT will satisfy all employers that are looking to hire the best in the business. We provide classroom training using highly knowledgeable ASNT Level III instructors to give you the skills needed to become a great non-destructive inspector. We offer training in the most sought after inspection methods including visual, liquid penetrant, magnetic particle, ultrasonic, radiography and eddy current. STS NDT is also proud to announce that we are now offering an approved 40-hour Radiation Safety Course. This course is required by everyone that’s interested in becoming an industrial radiographer. 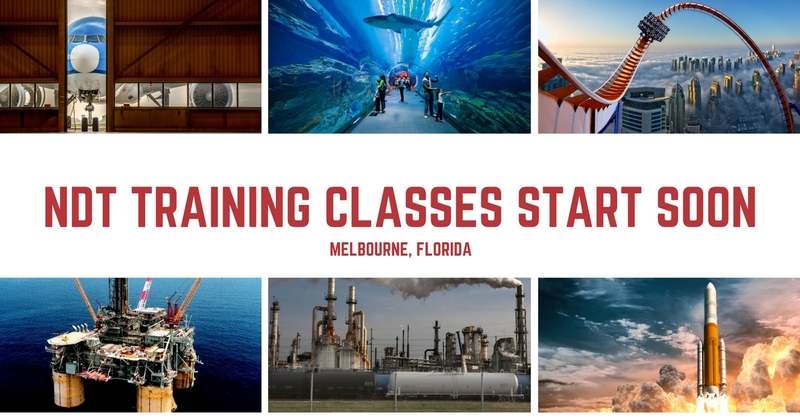 We have the following classes starting soon, so please register now to secure your spot. If you have questions, or perhaps you need additional information, give us a call at 561-962-3000. Alternatively, you can always send an email to: info@stsndtservices.com. Once again, congratulations on taking the first step to starting or improving your career in non-destructive testing. Summary: PT is a widely applied and low-cost inspection method used to locate surface-breaking defects in all non-porous materials (metals, plastics, or ceramics). Summary: MT is a non-destructive testing (NDT) process for detecting surface and shallow subsurface discontinuities in ferromagnetic materials such as iron, nickel, cobalt, and some of their alloys.